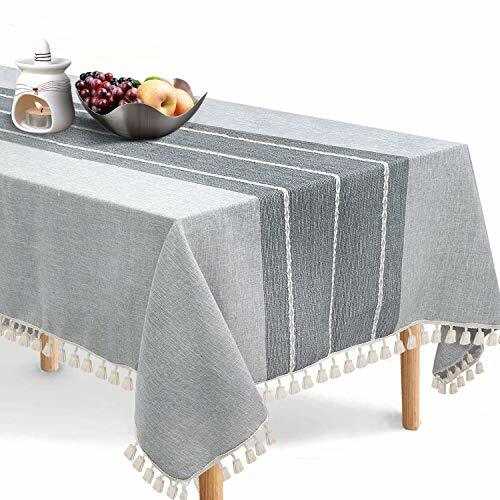 This stitching tassel tablecloth is prepared from heavy weight cotton linen fiber,in gray tone-on-tone color, Ultra soft and comfortable, natural skin-friendly that is to help you match the kitchen, dining room, gathering, or other outdoor living space. Usages: Dinner table, coffee table, book desk, storage table, curtains, blanket, wall decoration, picnic outdoor and just anything you must cover picnic outdoor. Hand and machine wash in cold water. PERFECT DESIGN: This Stitching Tassel Tablecloth with linen fabric is quite fashion and delicate, which is comfy, soft, skin-friendly, and durable. SIZE: 55 × 55 inches (140cm × 140cm); please choose it according to your need. MULTIPURPOSE: This Tablecloth is Great for dinner table, coffee table, book desk, storage table, curtains, blanket, wall decoration, picnic outdoor and just anything you must cover picnic outdoor.